Google has officially launched its second generation tablet New Nexus 7 in India and now available on Google Play Store. It has the same name as previous model Nexus 7 released in 2012 but it comes with advanced specifications. The Nexus 7 2013 packs 7-inch LCD HD Capacitive touch screen display with 1920x1200 pixels resolution. It is powered by 1.5 GHz Qualcomm Snapdragon S4 Processor with 2 GB of RAM. New Nexus 7 is the first high resolution 7-inch tablet in world and installed with Android 4.3 Jelly Bean operating system. It has 16 or 32 GB of internal storage and features 5 MP rear camera with 1.2 MP front facing camera. The device has the stereo speakers with virtual surround sound features. New Nexus 7 has the connectivity options are 4G LTE optional, Wi-Fi, Bluetooth 4.0 and NFC. 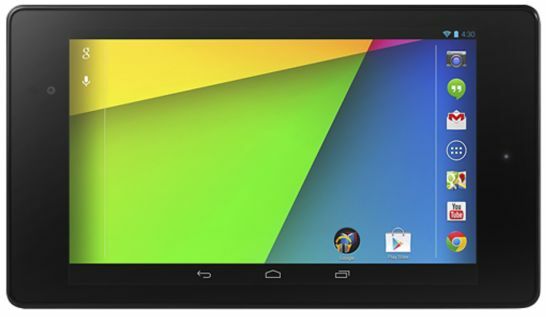 Google Nexus 7 16 GB version is priced at Rs.20999 and 32 GB version is priced at Rs.23999. The 4G LTE version of Nexus 7 32 GB is priced for Rs.27999. The tablet is now available on Google Play Store in India. You can pre-order now and the delivery starts from November 26, 2013.